JusticeProtectorTyrael: You really don’t get it. 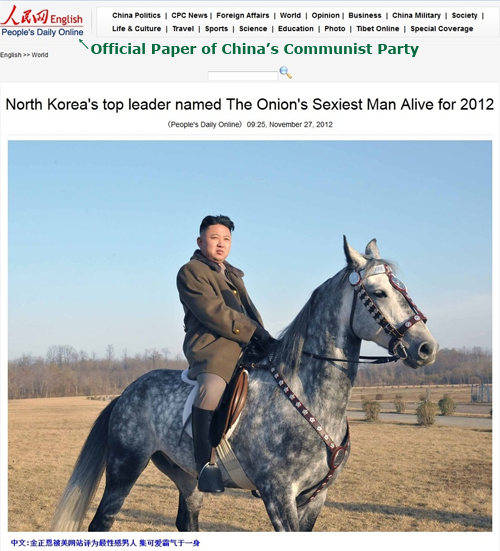 The People’s Daily Online is also a parody site! TeacherHeJiong: Certainly, this mistake was committed by some temporary worker at @PeoplesDaily. It has nothing to do with the “newspaper of truth” @PeoplesDaily. Ivan: Seeing the People’s Daily commit such a blunder, I can’t help but worry about the intelligence of these “mouthpieces”… However, you really can’t blame them. Nowadays, it’s harder and harder to find great, glorious, and correct events. Stretched as they are for positive news, they would seize this opportunity like a fat kid on cake. I can understand if they were so happy that they forgot to judge its authenticity. David Carr has a good piece in the New York Times on how attacks against journalists in conflict zones are being written off as attacks on terrorists and terrorist supporters. Mahmoud al-Kumi and Hussam Salama worked as cameramen for Al-Aqsa TV, which is run by Hamas and whose reporting frequently reflects that affiliation. They were covering events in central Gaza when a missile struck their car, which, according to Al-Aqsa, was clearly marked with the letters “TV.” (The car just in front of them was carrying a translator and driver for The New York Times, so the execution hit close to our organization.) And Mohamed Abu Aisha, director of the private Al-Quds Educational Radio, was also in a car when it was hit by a missile. I would think there would be better examples of the use of war to attack journalists. Journalists from Al-Aqsa have as much editorial freedom as those from Xinhua or the North Korean media. Should journalists — independent or not — have been targeted? Nope. Should Israel have targeted the journalists in their vehicle? Nope. Is Al-Aqsa TV independent from an organization centrally involved in a war? Also, nope. Under a general theory of war-making, targeting propaganda arms of an enemy makes sense. But that means headquarters and propaganda masters, not necessarily the grunts. At a time when news outlets in the United States are cutting foreign operations for monetary reasons, cheap and ubiquitous technology has lowered the entry barrier for others who want to engage in journalism, some of whom are already in the theater of conflict and may have partisan motives. Many of those newer players are young and inexperienced in ways that make them particularly vulnerable in the middle of dangerous conflicts. Other journalists have close affiliations with partisan forces in these conflicts. As news media organizations become increasingly politicized, all journalists risk ending up as collateral casualties because they are working adjacent to outlets viewed as purveyors of propaganda. The term “Black Friday” started with a complaint about all the people blocking the streets when they went out shopping on the Friday after Thanksgiving. It soon became known as the day the retailers “get into the black” — made a profit — on their account books as people storm the stores to begin Christmas shopping. So it is clearly a U.S. thing. In Brazil, the idea is the same for consumers, use the day to buy something on sale in time for Christmas. (Whether that item is a gift or a self-gift.) But given the high import duties (Brazil is a nasty place to buy imports, with some duties as high as 200 percent), transportation taxes between the states (think of the old Confederated States of America) and city, state and national taxes, things are still expensive. Take the ipad 2, for example. It was being offered in a special Black Friday sale for R$1099 ($526) – a bargain by Brazilian standards but still over 40 per cent more expensive than the standard price on Apple’s US website. And then there is Honduras. They don’t just have “Black Friday” they have “Black Week” and some stores extend the sales through Sunday. Once again, the idea is for the stores to offer sales to entice shoppers in. In Honduras, however, the prices are not as outrageous as Brazil largely because of the Central American Free Trade Agreement. The adoption of “Black Friday” in Honduras has a few people upset. They argue that if the stores can offer discounts of up to 70 percent, that means the rest of the year the shops are earning an 80 percent profit. If “department stores nationwide join the American tradition and offer discounts of up to 70%” (this part is in the text) means that these entrepreneurs…have a profit margin of over 80%. In that head you will be investing for not winning? Others complain that Honduras is doing nothing on its own and only blindly following a fad from another country. NEVER HAVE HAD YOUR IDENTITY OR IDEAS, ALL YOU DO IN MEXICO…UNITED STATES… Hondurans and repeat it!! What does that mean for Americans scratching, crawling and pulling guns on each other on the US Black Friday? Well, to be honest to many of these people, the international connection means little. But for reporters it could mean a series of stories that show how a U.S. tradition has been transplanted and how it affects jobs and income in the United States. All of these stories could be done without ever sending a reporter to Brazil or Honduras or any other country. Intelligent use of the International Trade Statistics page can nail down who are the major international buyers of a states’ goods and services. And using the Census Bureau site can tell what country sent the most immigrants to a specific area in the States. This is not rocket science folks. It is good journalism to be curious and to look for ways to inform readers, viewers, listeners about how they are connected to the world. It is all part of informing and putting things into context so that the American people are better informed about what is going on around them. International End the Impunity Day is November 23. The International Freedom of Expression Exchange site has a digital game designed to draw attention to impunity and motivate more people to engage in the issue called Break The Silence. In one scenario in this game, you are a Twitter user in the Americas. Drug cartels and organised crime have infiltrated the political, judicial and law enforcement systems in your country. In another, you are a musician in Africa. Your government is handing down orders to silence artistic expression. Those who challenge the status quo are being censored, and those who persevere are being threatened and intimidated. In a third, you are a protester in the Middle East, in a country with an established authoritarian regime in power. Voices of dissent are violently suppressed by the police and military. In each scenario, you must navigate through a labyrinth where others are doing everything they can to silence your voice. Drug cartels and organised crime have infiltrated the political, judicial and law enforcement systems in your country. Those who speak out about the corruption are often faced with threats, attacks and even murder. These crimes are rarely punished. What will you risk to be heard? You witness an exchange of cash between a known drug lord and the chief of police. You decide to tweet about it on your Twitter account. So far, this all sounds familiar to anyone living in Honduras or Mexico. From this point you make choices about whether to keep pushing ahead or back off. Depending on how you decide the danger to you and your family increases or decreases. The game accurately describes what can (and does ) happen to people who stand up to narcos and dictators. Before people start complaining about all the money “wasted” on programs overseas to break up the narcos and support democratic forces, they should play this game and see what it really costs to not stand up to these thugs. Freedom House has a good piece by Sarah Cook, a Freedom House Senior Research Analyst for East Asia, on how things might go in China, based on what they are doing now. The piece was written before Xi Jinping was anointed as leader for the next 10 years. But it does show the problems China has and will continue to have as its population gets younger and more world savvy. The leadership in Beijing knows that the old ways of massive repression will not work. At the same time, however, they want to maintain control of the social and political process. (And tightly “guide” the economic sector.) They are torn between the old and the new. [I]f a new generation of party leaders wished to move in a more tolerant direction, they would face great resistance from those who have gained status and wealth under the current system, and who fear repercussions if their abuses are exposed. But if the downward spiral of repression continues, it risks sparking further popular resentment and unrest, as Chinese citizens become more assertive of their rights. Always facing the leadership are those pesky people in the countryside and in the cities with mobile phones. And, as Cook points out, the Chinese people are beginning to learn more about their rights — limited as they may be — under Chinese law. A while back I posted a piece on how the congress of the Dominican Republic was pushing through a packet of bills that would make it publishing or airing offensive expressions against the top government leadership and members of congress a criminal offense with imprisonment of two to three years and large financial penalties. And I cannot believe the response it got from journalists in the DR. It confirms what I said about how the journalists in the Dominican Republic fight fiercely for their rights. If that bill goes through they will have to start building new jails, many more and prepare for what’t to come, because we won’t fighting, This is something that they are doing out of fear, but this time, for the first time in decades we will not let them pay us with circus and bread. WE WILL NEVER BACK DOWN! THEY CAN TRY WHAT THEY WILL ; THEY WILL HAVE TO BUILD NEW JAILS TO FIT ALL OF US!!! I live in Dominican Republic, plenty of local groups are protesting against this and the new huge taxes the government has just approved, but it seems that most of the local press is being paid and pushed by the government to avoid commenting about what’s happening. The local press appears to be ran by the same people governing this poor country. They can’t keep educated young professionals from speaking our minds and for trying to defend ourselves from the abuse of this outrage. The last comment offers hope. Young people are using new media to demonstrate and push back against the government and its attempts to silence criticism of the government. The legislation in the Dominican congress has the country moving in a direction opposite of its Caribbean neighbors and with democracies around the world. Unfortunately the issue is not resolved. The Committee to Protect Journalists and the International Press Institute have campaigns against criminalizing libel. The battle in this area can directly affect journalists from other countries. The way I read the proposed DR legislation, ANY criticism of government leaders (as listed in the bill) could lead to criminal charges. That means anyone from anywhere who wrote of possible corruption or poor performance by a Dominican official in any publication (or website) could be arrested if he/she stepped foot in the DR.
Not exactly a law that helps support a fragile democracy. The journalists in the DR — and in the other struggling countries — could use some statements of support from more journalism groups. It would be nice to see the SPJ, the NABJ, the NAHJ and the AAJA speak out on this issue and offer support. Brazil’s courts and laws still haven’t caught up with 27 years of democracy and free speech. The Knight Center for Journalism in the Americas spotlighted the latest case. The courts have become the greatest hurdle to freedom of expression in Brazil, according to international groups like Inter American Press Association and Freedom House. If judicial offensives are a hurdle for large media organizations, any participation in the political sphere by small websites and blogs can be a death sentence. Without the means to shoulder the costs of judicial representation, bloggers can end up bankrupt and forced to close their operation. It wasn’t just a blog for self-reflection, I liked putting stuff there that shook things up. The blog denounced a gang of human traffickers operating in Paraná and countries like the Dominican Republic, Ecuador and the United States. The gang was the first to try and censor the blog. They got a court order to take down the posts about the case. While the judge was reviewing the appeal, the gang was arrested. But even then they brought another suit against me for moral damages. So those were the first two lawsuits. That bears repeating: A gang got a court to order the posts about the gang’s case taken down. Even after the gang was arrested, it filed another another suit against for moral damages. And the courts went along with it. The gang in Paraná that I denounced requested the judge to “make an example” out of me. The objective is not the money, it’s really to strangle [our voice]. They know they are going to lose but the kind of people I denounce on my blog are used to the legal framework and it’s no trouble for them to start proceedings against someone. It’s very easy for them to accuse. The law is so convoluted that anyone writing about the defendants in a public trial can be sued for libel in the criminal courts if the writer mentions anything bad about the defendants. The heartening thing, however, is the hard work of Brazilian journalists and bloggers and their willingness to fight for press and speech freedoms despite laws that were written in the days of the dictatorship.